It's a happy day today as I am here to share with you my projects for my very first post with The 12 Kits of Holidays! You can imagine how excited that I was when Renee Lynch asked me if I would like to join the group this year. Sadly both Suzanne Dahlberg and Cathy Webber are leaving the group, they will be missed. Kelly Schirmer and I are joining the group. You may have noticed that the logo has changed this year as well. It is no longer the 12 Kits of Christmas but the 12 Kits of Holidays, so each month has a different theme. This month Joyce is the host and she sent out the most amazing collection of Valentines goodies. I made 7 of her self-assembling cards and I still have lots left over to make more. Please stop in to see the rest of the group and their amazing inspiration! Sharron, On Papillon Wings You're here! Slipping in to share a card for this week's CAS-ual Fridays challenge! This week we are making a clean and simple project that uses markers. 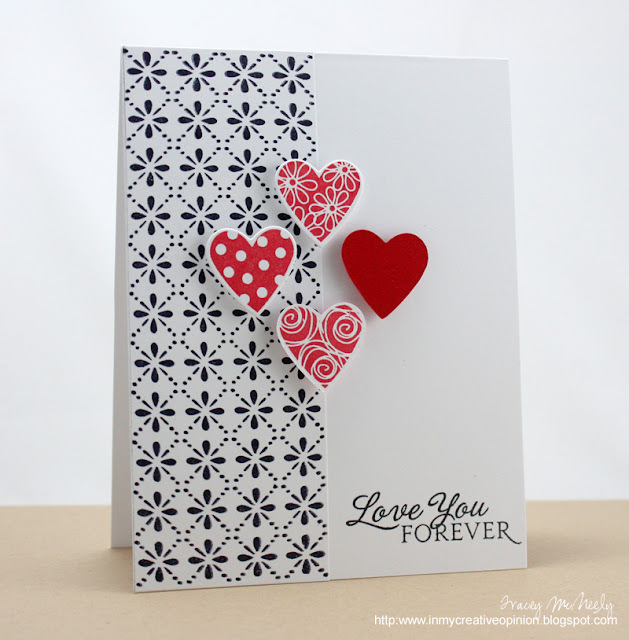 One of my favourite CAS stamps is Papertrey Ink's All About You Additions. One image that really packs a punch! 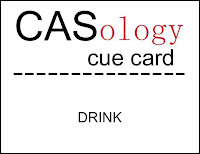 when you are in the need for a quick CAS card. It has been a really long day, well yesterday was, I am just still going. A long day in a week that has been really long. 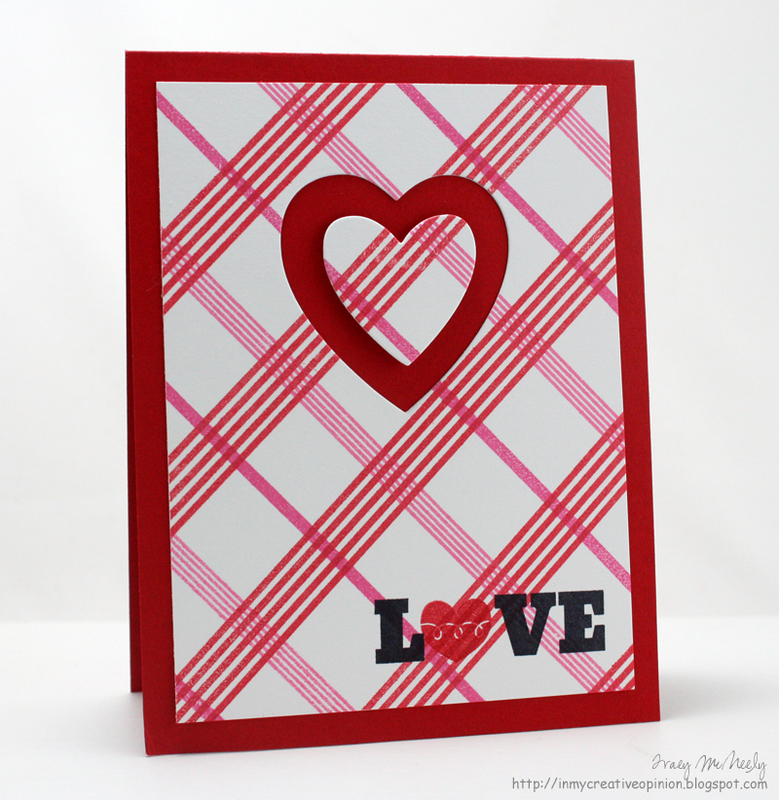 Of course it is being a Mom first, cards second! Hee hee hee. 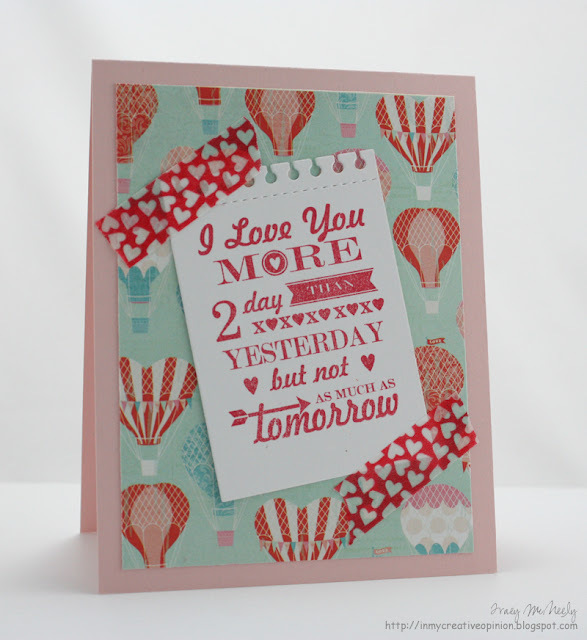 Day 2 of Clean & Simple Card Making 2 and what a day it has been. It all started when I decided to become a parent 18 years ago! Well exams are over for semester 1, but University applications are in high gear, which is another new experience for me and it is cutting into my crafty time. LOL Which of course I don't mind. So a bit late in the day to finally complete today's card but here it my take on today's one layer card with embossing based on Debby's technique. 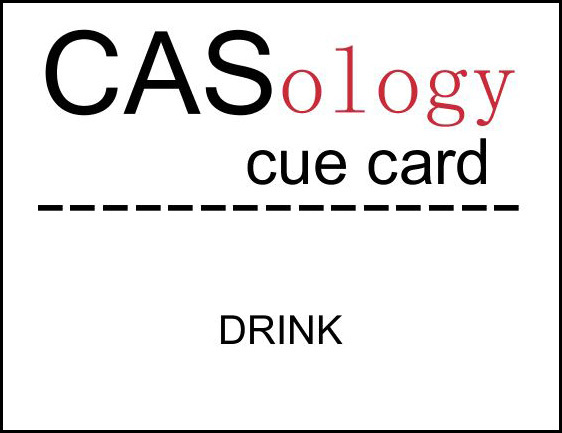 Happy Tuesday and time for this week's CASology Cue Card! I enlisted the help of Microsoft Word and my printer to create my hybrid tic-tac-toe board. 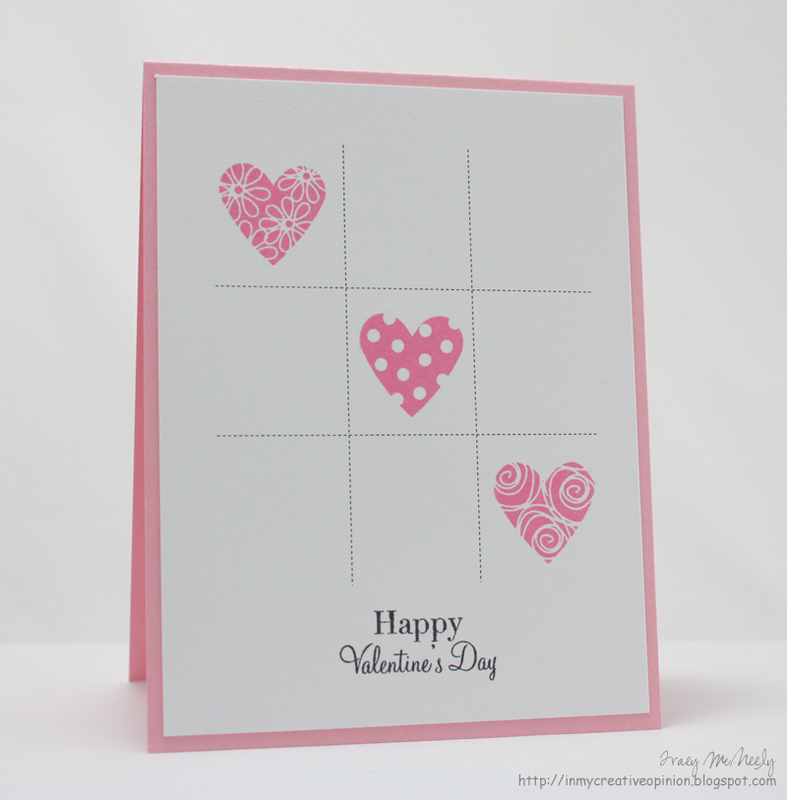 Once printed I stamped my three in a row. I thought this would be the perfect Valentine for my daughter. I can't wait to see what GAME means to you! 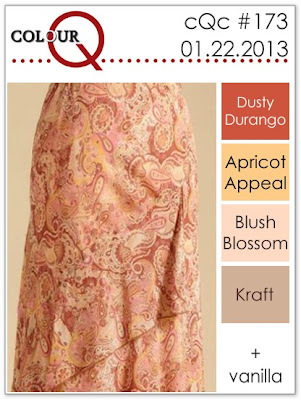 Are you ready for this week's colourQ palette? 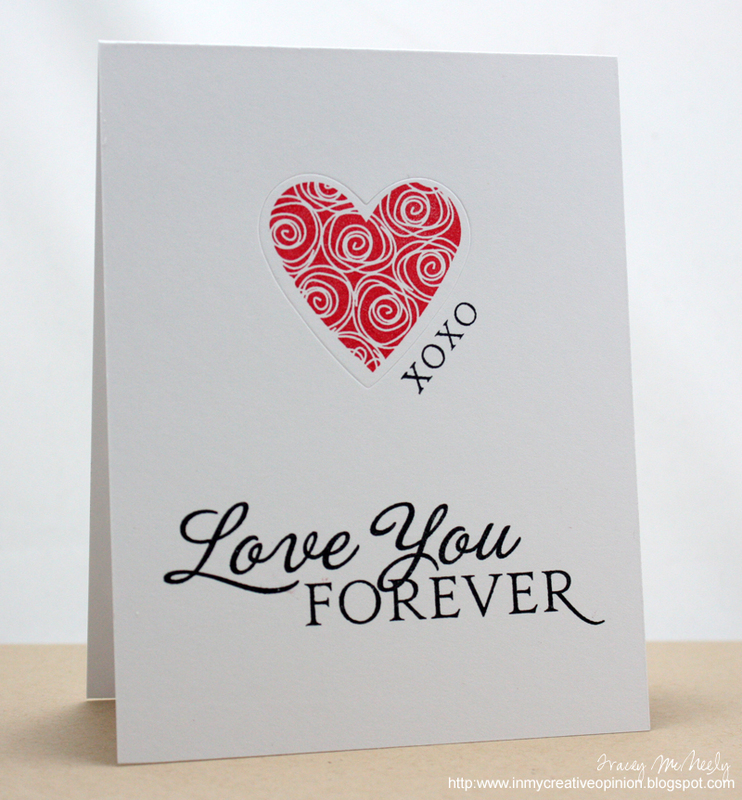 No question there is no shortage of Valentines cards these days, but unless the sentiment specifically says Valentines there are so many possibilities. 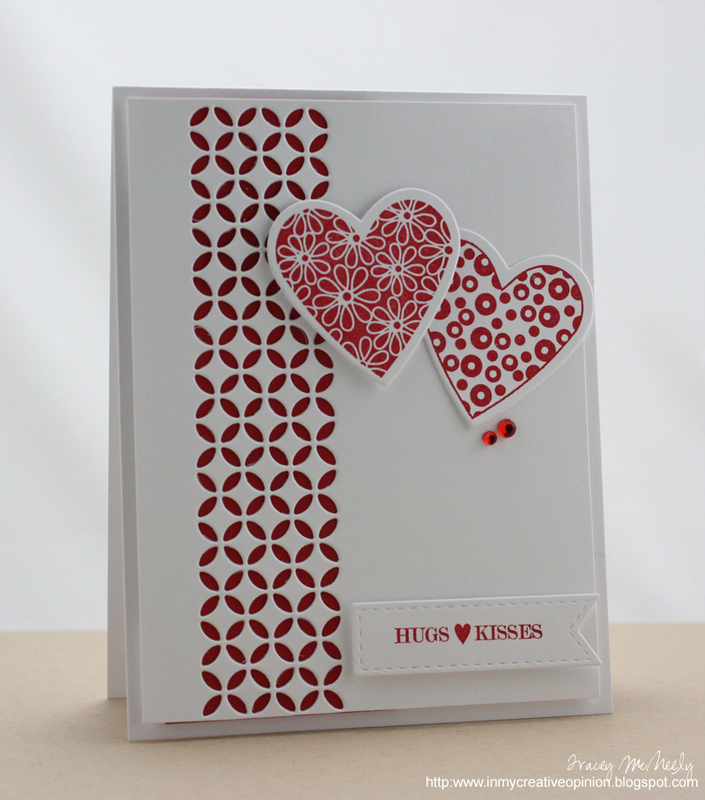 So this week I created a card to send some kisses to someone who may need them after he sees the red spray ink in the laundry room sink! 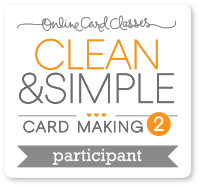 Are you taking Clean & Simple Card Making 2? 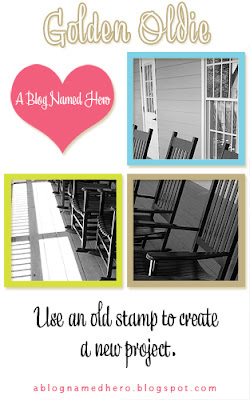 I was so excited that I won a spot in the class from JJ Bolton's blog. I am sharing the card I made for today's homework. 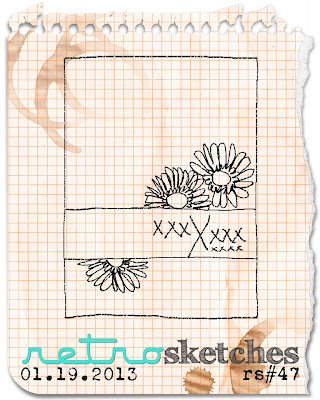 Today we were to create a card using one of the four sketches provided. I decided to use Kristina's sketch and kept pretty true to it. There was a first for me today, I have had sitting in my marker carousel for over a year two Smooch Spritz spray inks...sealed. I have always been really afraid to try it, but today I was brave. Now because this is new territory I didn't have a box to spray into. So I decided to tape what I was spraying to chipboard and spray over the laundry room sink. I really hope my husband doesn't go in there until I have a chance to clean it up. Now my card is my second attempt, I actually liked the first card I sprayed better, it was more subtle. However, when I tried to faux stitch around the circle I ran into some trouble. Do you think I was nervous? So we are going no stitching. Can you believe it is the 25th of January? Wow time flies. 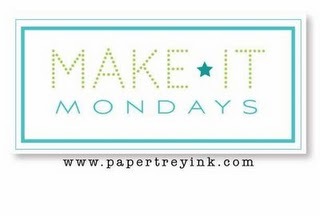 Time for the January 2013 Papertrey Ink Blog Hop. 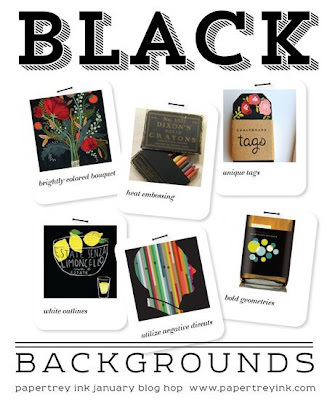 This month the theme is black backgrounds. 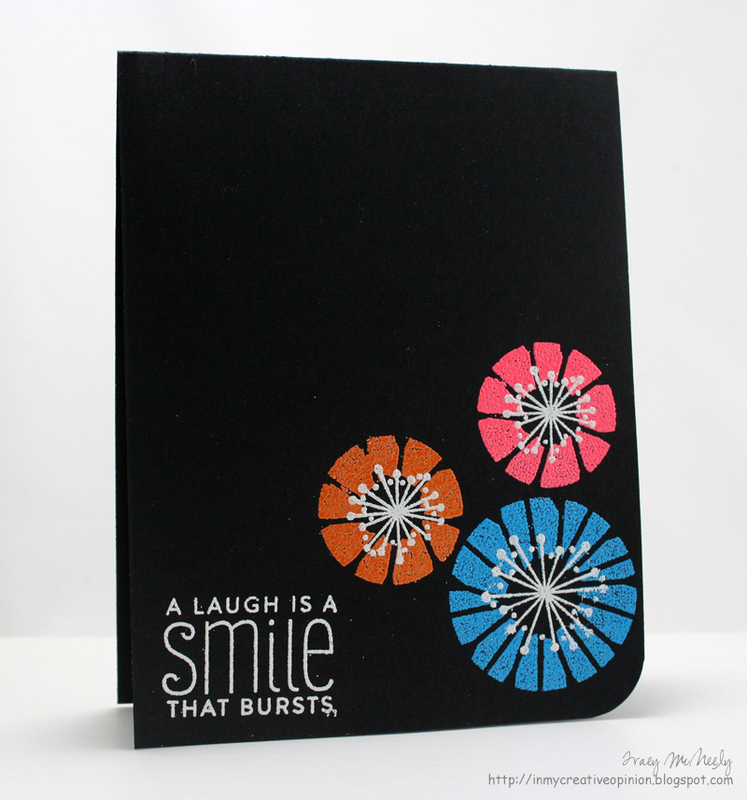 What I learned very quickly is that black is not very forgiving and especially with embossing powders. 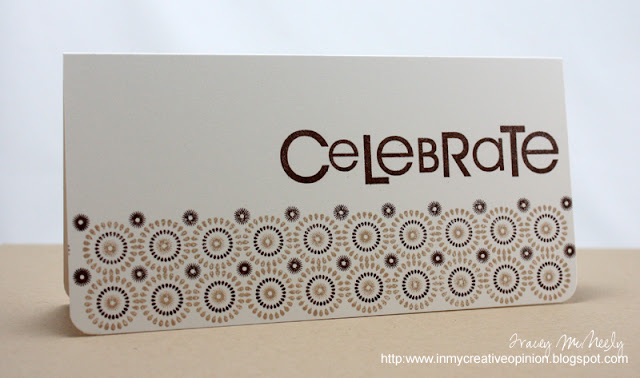 Even though I use my embossing buddy, the powder still wanted to stick. I decided to go with a one layer all black card and then double emboss it as Heather Nichols showed us in this week's Make it Monday. I love the look of the double embossing and the white really popped. Edit: I did end up with two tiny specs melted in the wrong place, I tap of my ultra fine black Sharpie hid the evidence. It's hard to believe that it has been two years since I started my blog. 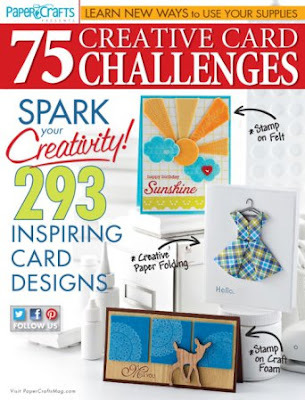 I began my blog so that I could share my love of papercrafting, inspire and participate in challenges. 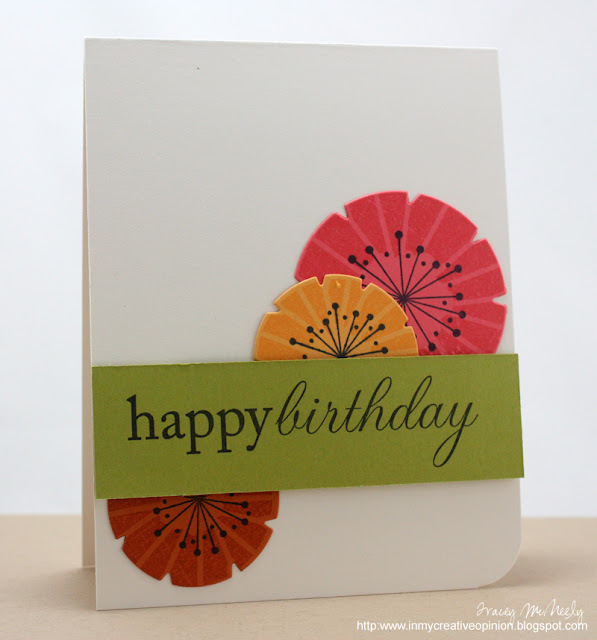 My very first card posted was this one for the January 2011 Papertrey Ink Blog Hop. Throughout these past two years I have made so many wonderful friendships and been inspired by so many papercrafters around the world. 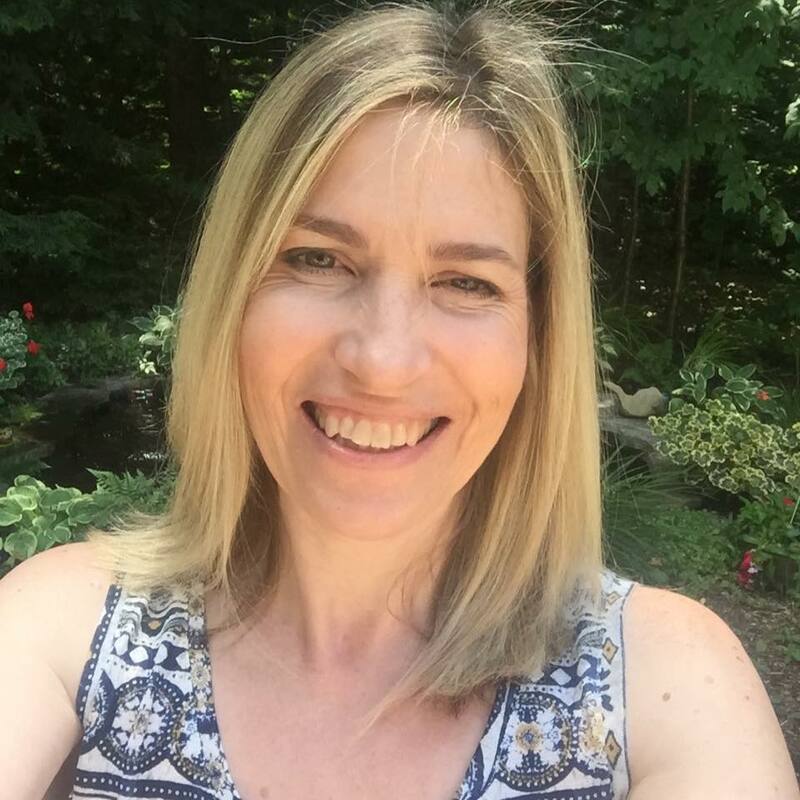 I am honoured to be on both the CASology and the colourQ Design Teams and I am also thankful everyday that I have so many friends come and visit my blog always full of support and encouragement. You have all given me so much confidence in myself. Now we can't have a post without a new card so I am sharing this card that I made for the Moxie Fab World 75 Creative Card Challenges Week: Challenge #49--Make Your Own Background Paper. A quiet week at home has been anything but. Two kids starting exams on Thursday and we are in the throws of completing University Applications for my son. It is a balmy -18 Fahrenheit in Toronto tonight with the wind chill. So to keep warm I found a moment to create a card for this week's RetroSketches challenge. This week's sketch is based on a beautiful card made by Jen Mitchell. 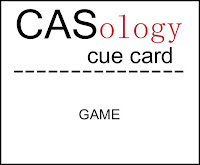 Time for a Tuesday Happy Dance and this week's CASology Challenge. 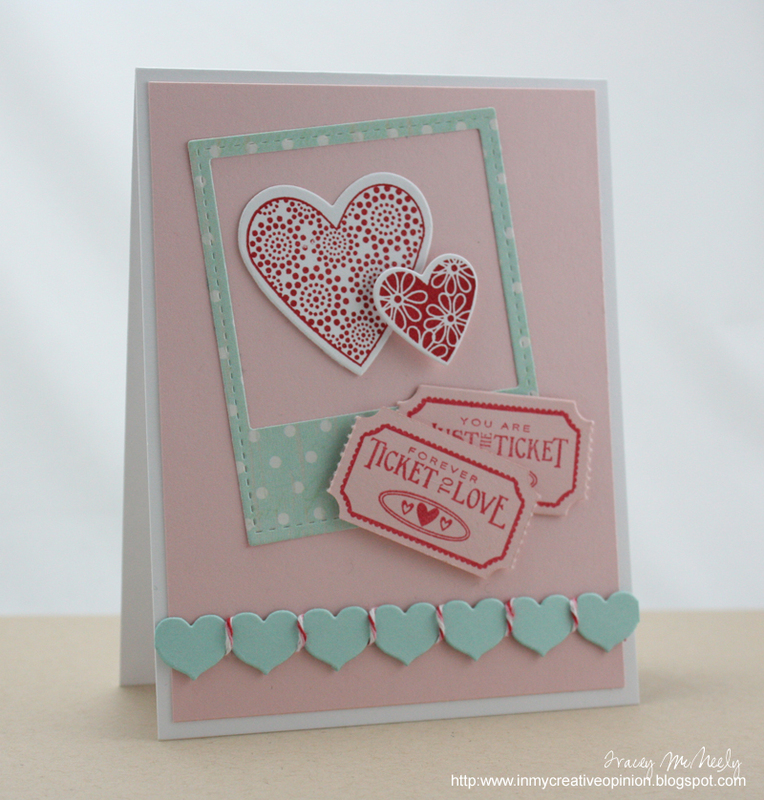 For my card this week I pulled out my well loved Papertrey Heart-2-Heart #1. 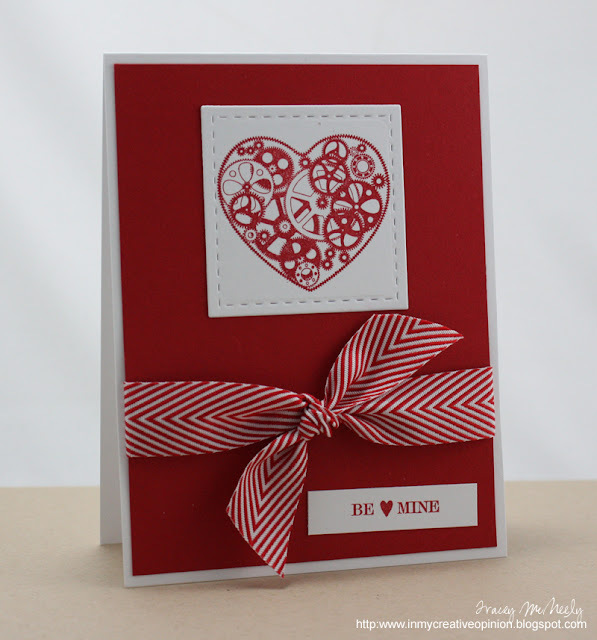 This week to illustrate another approach to CAS design I used only one colour, Autumn Rose. 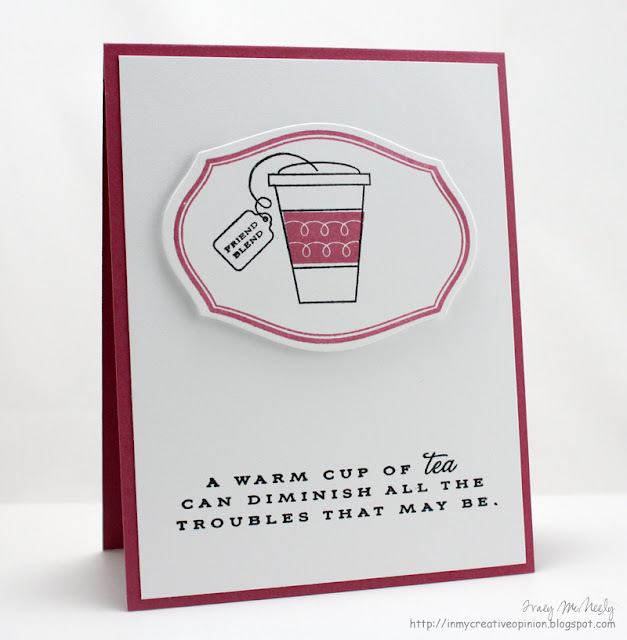 I used this colour as a mat, a border on my die cut and the sleeve on my cup to create a cohesive design. I can't wait to see what DRINK means to you! 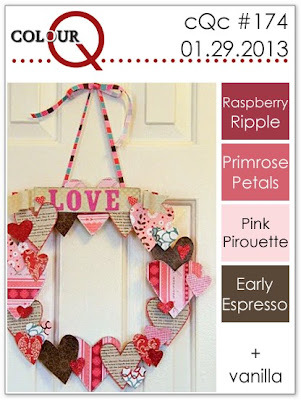 Time for this week's new colourQ challenge. It was kind of fun to make a card that isn't for an occassion. 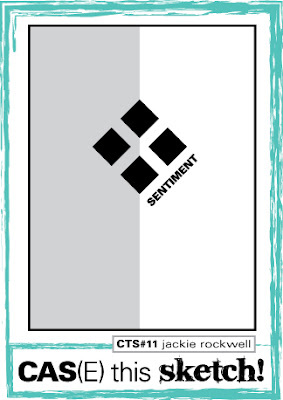 In fact I didn't even put a sentiment on the front. I like to have some cards on hand that don't have a sentiment on the front and you can either put a handwritten note inside, or stamp a sentiment on the inside when you need a card. This could be for a thank you, a birthday, friendship, Easter, congratulations or just because. Here is this week's colour palette. 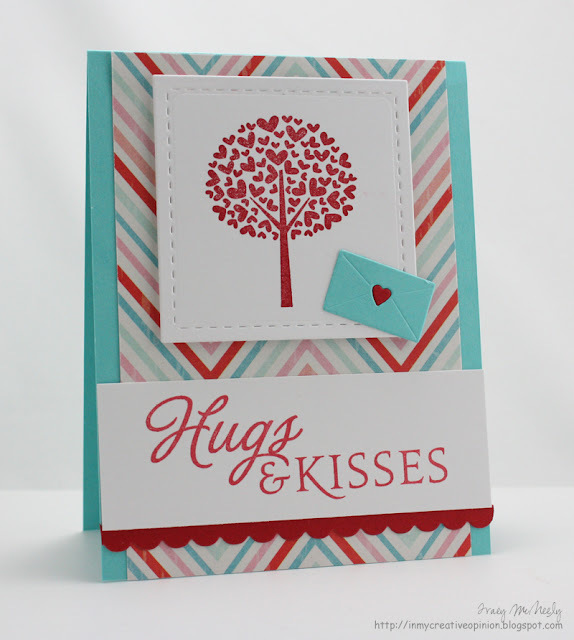 Good morning I am here today to share a card I made using the sketch from CAS(E) this Sketch, the colours from this week's Dynamic Duos and submitting it to the current A Blog Named Hero Challenge. For CAS(E) this Sketch the sketch has the page divided in half. 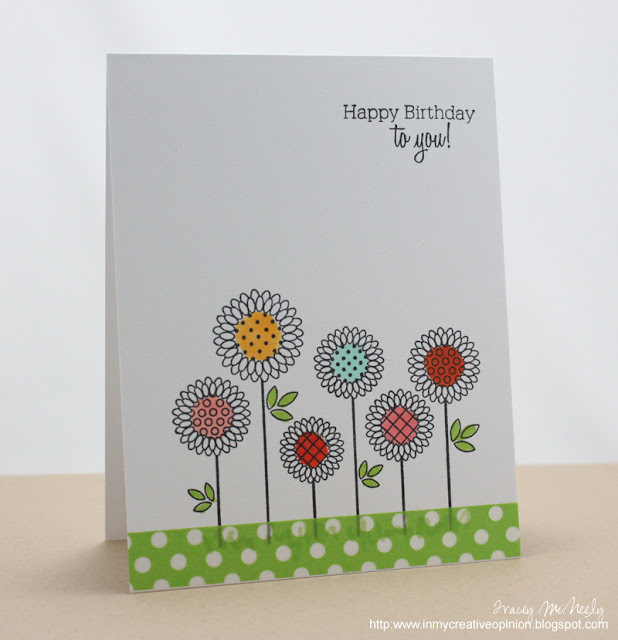 I pulled out my older Hero Arts Dots and Blossoms large woodblock background stamp to create a black pattern on half of my card. 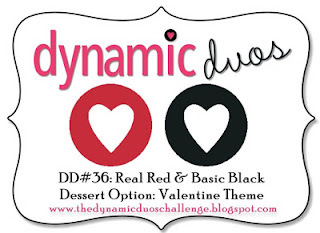 Dynamics Duos was to use black & red and as a dessert option of Valentines. For that part of the challenge I used hearts and a sentiment from Papertrey Ink's Heart Prints. 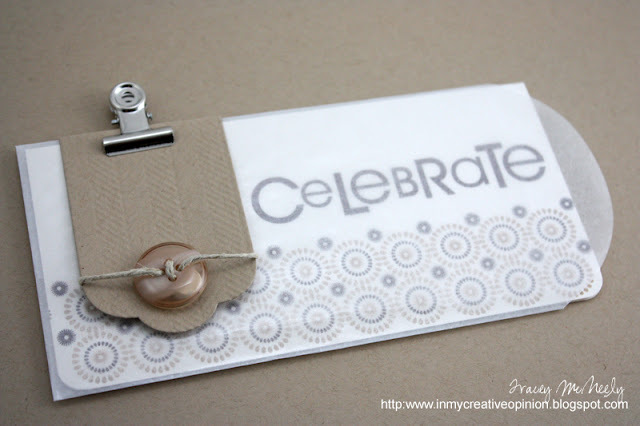 There is a fun challenge over at CAS-ual Fridays this week. 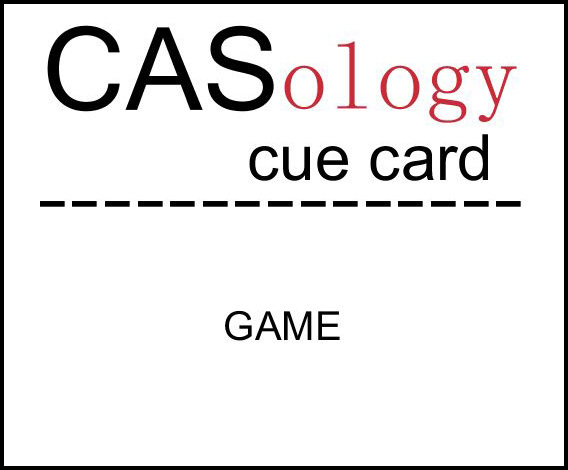 The challenge is to make a CAS card that has one long side and one short side. So I created a card that is 3 x 6. My husband is starting a new job and a new career this week. Last year after spending 14 years working endless hours for a big company in Toronto downsizing left him without a job. The last year has been challenging, but now he is embarking on a new career and working for a great guy--himself. So to let him know how happy we are I made this card for him. I didn't have an envelope the right size for this, so in comes this week's Make It Monday which is to make packaging for cards that will not fit into a regular envelope. I had purchased some glassine envelopes to put custom notepads into and the fit was perfect for my card.